Venture to the symphony with the Spurs' center Pau Gasol and learn about his love of classical music. The entire episode will air Tuesday at 10:00pm Eastern. Venture to the symphony with the Spurs' center Pau Gasol and learn about his love of classical music. The entire episode will air Sunday at 6:30pm Eastern. LaMarcus Aldridge scores 28 points with 12 rebounds, Rudy Gay adds 22 with 11 boards as the Spurs win it, 126-114. DeMar Derozan posts 28 points, leading the Spurs over the Timberwolves in his first game as a member of the San Antonio Spurs. DeMar DeRozan scores 20 points and has two assists as the Spurs get the win over the Magic, 100-81. Taurean Prince led his team with 25 points and six rebounds as the Hawks defeated the Spurs 130-127. 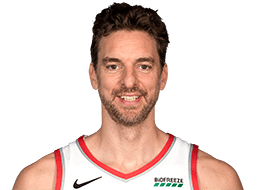 Pau Gasol is #67 on our #Fantasy100! A solid season of 2075.8 fantasy points, how serviceable is Gasol for 2018-19 and where should you target him? FNTSY Sports Network’s Frank Stampl has more! Rudy Gay and Manu Ginobili were spark plugs off the bench scoring 18 and 17 points respectively as the Spurs comeback to beat the Kings 98-85. Willie Cauley-Stein had 25 points and 10 rebounds for Sacramento in the loss. Appeared in 60 games (all starts) for the Lakers in his 13th NBA season, averaged 17.4 points, 9.7 rebounds, 3.4 assists, 0.5 steals and 1.5 blocks in 31.4 minutes ... Notched 20 points and 11 rebounds 11/1 at SAS … Recorded 25 points and 12 rebounds 11/13 at DEN … Totaled 24 points (11-19 FG) and 10 rebounds 11/22 vs. GSW … Finished with 20 points and 10 rebounds 11/24 vs. SAC … Tallied 21 points and 8 rebounds 11/27 at BKN … Recorded 21 points and 9 rebounds 12/17 at MEM … Had 21 points, 13 rebounds and 8 assists 12/20 vs. MIN … Finished with 23 points (10-17 FG), 17 rebounds, 8 assists and 3 blocks 1/3 vs. UTA …Notched 25 points, 10 rebounds and 3 blocks 1/5 vs. DEN … Tallied 21 points and 12 rebounds 1/8 at HOU… Had 24 points, 13 rebounds and six assists 1/17 at BOS … Tallied 20 points, 19 rebounds, 5 blocks and 3 steals 1/20 at CHI … Totaled 22 points, 11 rebounds and 3 steals 1/23 at MIA …Posted 21 points, 11 rebounds and 6 assists 1/24 at ORL … Notched 20 points and 13 rebounds 1/26 at NYK … Recorded 21 points and 13 rebounds 1/28 at IND … Finished with 24 points and 9 rebounds 1/31 vs. CHA … Had 22 points (8-12 FG) and 11 rebounds 2/23 vs. BKN … Recorded a season-high 29 points with 12 rebounds 3/4 vs. NOP … Scored 27 points 3/7 at DEN … Tallied 20 points and 11 rebounds 3/9 vs. OKC… Had four blocks with 18 points and 11 rebounds 3/14 at SAS … Tallied 22 points, 10 rebounds, 6 assists and 4 blocks 3/19 vs. SAS … Notched 30 double-doubles … 19 games with 20+ points. 2012-13: Appeared in 49 games (42 starts), averaging 13.7 points, 8.6 rebounds, 4.1 assists, 0.49 steals and 1.24 blocks in 33.8 minutes ... Recorded 15 double-doubles and two triple-doubles on the year ... Scored 20+ points seven times ... Grabbed 10+ rebounds 16 times and 20+ rebounds once ... Handed out 10+ assists three times ... Posted 23 points, 13 rebounds and six assists 10/30 vs. Dallas ... Scored 15,000th career point (17 points) 11/18 vs. Houston ( 10th foreign born player to reach 15,000 points; 17th NBA player ever to record 15,000 points, 7,000 rebounds, 2,000 assists and 1,000 blocks) ... Recorded 17 points, 11 rebounds and seven assists 11/20 vs. Brooklyn ... Scored 25 points 1/20 at Toronto ... Recorded 22 points and 12 rebounds 2/1 at Minnesota ... Posted 23 points and 10 rebounds 2/3 at Detroit ... Totaled 12 points and 10 assists 3/30 at Sacramento ... Tallied 14 points, 10 rebounds and six assists 4/2 vs. Dallas ... Totaled 12 points, 13 rebounds and eight assists 4/7 at LA Clippers ... Tallied 22 points and 11 rebounds 4/9 vs. New Orleans ... Recorded 23 points, seven rebounds and nine assists 4/10 at Portland ... Posted 6th career triple-double with a season-high 26 points, 11 rebounds and 10 assists 4/12 vs. Golden State ... Tallied 7 points and 16 rebounds 4/14 vs. San Antonio ... Posted 7th career triple-double with 17 points, a season-high 20 rebounds and a season-high 11 assists 4/17 vs. Houston ... Missed 33 total games due to injury: eight games with tendinitis, left and right knees (12/4-12/16), five games with a concussion ( 1/8-1/15) and 20 games with a torn plantar fascia, right foot (2/7-3/18) ... In four playoff games (all starts), averaged 14.0 points and 11.5 rebounds in 36.4 minutes ... Recorded first career playoff triple double with 11 points, 13 rebounds and 10 assists 4/26 vs. San Antonio. 2011-12: Appeared in 65 games (65 starts), averaging 17.4 points, 10.4 rebounds, 3.7 assists, 0.57 steals and 1.35 blocks in 37.4 minutes ... Recorded 42 double-doubles and one triple-double on the year ... Scored 20+ points 22 times including one 30+ point game ... Grabbed 10+ rebounds 42 times ... Handed out 10+ assists twice ... Led team in points seven times, rebounds 26 times, assists eight times, steals 12 times and blocks 25 times ... Ranked among league leaders in scoring (25th/17.4), rebounds (7th/10.4), assists (35th/3.7), FG% (19th/.501), blocks (20th/1.35) and minutes (24th/35.2) ... Posted 22 points and a season-high five blocks 12/27 at Utah ... Scored 26 points 1/19 at Miami ... Scored 14,000th career point 1/20/12 at Orlando ... Recorded eight points, eight rebounds and 10 assists 1/22 vs. Indiana ... Totaled 23 points and 10 rebounds 1/25 vs. LA Clippers ... Scored 28 points (11-15 FG) 1/29 at Minnesota ... Posted 13 points and a season-high tying 17 rebounds 2/3 at Denver ... Recorded 24 points and 16 rebounds 2/4 at Utah ... Posted 25 points and 14 rebounds 2/9 at Boston ... Tallied 16 points and a season-high tying 17 rebounds 2/12 at Toronto ... Totaled 20 points, 13 rebounds and four blocks 2/14 vs. Atlanta ... Grabbed 7,000th career rebound 2/20/12 vs. Portland ... Posted 24 points and a season-high three steals 2/22 at Dallas ... Posted 20 points, 10 rebounds, six assists and four blocks 3/6 at Detroit ... Scored 27 points (13-16 FG) 3/21 at Dallas ... Totaled 19 points and a season-high tying 17 rebounds 3/27 at Golden State ... Posted 21 points and 11 rebounds 3/31 vs. New Orleans ... Tallied 26 points and 11 rebounds 4/1 vs. Golden State ... Recorded 22 points and 12 rebounds 4/3 vs. New Jersey ... Posted a season-high 30 points and 13 rebounds 4/7 at Phoenix ... Scored 25 points 4/9 at New Orleans ... Posted 21 points and 11 rebounds 4/11 at San Antonio ... Recorded 5th career triple-double with 22 points, 11 rebounds and a season-high 11 assists 4/18 at Golden State ... Tallied 20 points, 14 rebounds and nine assists 4/22 vs. Oklahoma City ... Missed season finale 4/26 at Sacramento (rest) ... In 12 playoff games (12 starts), averaged 12.5 points, 9.5 rebounds, 3.7 assists and 2.08 blocks in 37.0 minutes. 2010-11: All-NBA Second Team ... Western Conference All-Star (reserve) ... Appeared in all 82 games (82 starts), averaging 18.8 points, 10.2 rebounds, 3.3 assists, 0.59 steals and 1.59 blocks in 37.0 minutes ... Recorded 43 double-doubles and one triple-double ... Scored 30+ points three times and 20+ points 39 times ... Grabbed 10+ rebounds 45 times ... Led team in points 16 times, rebounds 35 times, assists 16 times, steals 13 times and blocks 42 times ... Ranked among league leaders in points (23rd/18.8), rebounds (6th/10.2), FG% (12th/.529), blocks (14th/1.59) and minutes (17th/37.0) ... Named WC Player of the Week 10/31/10 ... Scored 30 points 11/5 vs. Toronto ... Recorded 4th career triple-double with 20 points, 14 rebounds and a season-high 10 assists 11/7 vs. Portland ... Grabbed a season-high 20 rebounds 11/11 at Denver ... Posted 28 points (10-10 FG, 8-8 FT), nine rebounds and five assists 11/21 vs. Golden State, becoming the 3rd player in NBA’s shot clock era to record a perfect shooting night from the field and line (minimum 25 points, five rebounds, five assists) ... Recorded 6,000th career rebound 11/23 vs. Chicago ... Scored 13,000th point 1/19 at Dallas ... Recorded a season-high 34 points (13-17 FG, 8-9 FT) and 10 rebounds 2/5 at New Orleans ... Posted 30 points and a season-high 20 rebounds 2/16 at Cleveland (10th Laker in franchise history to post a 30/20 game) ... Appeared in 10 playoff games (10 starts), averaging 13.1 points, 7.8 rebounds, 3.8 assists and 1.70 blocks in 35.8 minutes. 2009-10: Appeared in 65 games (65 starts), averaging 18.3 points, 11.3 rebounds, 3.4 assists and 1.74 blocks in 37.0 minutes … Recorded 40 double-doubles on the year … Scored 30+ points two times and 20+ points 28 times … Grabbed 10+ rebounds 40 times … Led team in points 14 times, rebounds 37 times, assists 13 times, steals six times, blocks 34 times and minutes 23 times … Ranked among league leaders in FG% (11th/.536), blocks (8th/1.74) and minutes (21st/37.0) … Played in 59th NBA All-Star Game, totaling 13 points and six rebounds in 20 minutes … Named WC Player of the Week 3/22/10 … Named European Player of the Year by La Gazzetta dello Sport … Posted 17 points, 20 rebounds and seven assists 12/11 vs. Minnesota … Posted 16 points and 20 rebounds 12/12 at Utah … Tallied 24 points and career-high tying 22 rebounds 12/16 at Milwaukee … Posted a season-high six blocks 12/22 vs. Oklahoma City and 12/26 at Sacramento … Became the 6th player in NBA history to post at least 21 points, 19 rebounds, eight assists and five blocks in a single game 2/8 vs. San Antonio … Recorded 2,000th career assist 2/26 vs. Philadelphia … Scored 30 points 3/27 at Houston … Scored 12,000th career point, posting 26 points and a career-high tying 22 rebounds 3/29 at New Orleans, becoming the first Laker to have multiple 25-point/20-rebound games in a season since Shaquille O’Neal in 2003-04 … Recorded 16 rebounds and a season-high nine assists 4/2 vs. Utah … Scored a season-high 32 points 4/4 vs. San Antonio … Missed 11 games (10/27-11/17) with a right hamstring strain and six games (1/5-1/13) with a strained left hamstring ... Appeared in 23 playoff games (23 starts), averaging 19.6 points, 11.1 rebounds, 3.5 assists and 2.09 blocks ... Posted 12 20+ point games during the playoffs, one 30+ point game and 13 double-doubles ... Grabbed 18 rebounds while scoring game-winning put-back layup in game's final second 4/30 at Oklahoma City … Tallied a postseason-high 33 points and 14 rebounds 5/10 at Utah … Posted 25 points and a playoff career-high six blocks 6/6 vs. Boston … Tallied 17 points, 13 rebounds, and a playoff career-high nine assists 6/15 vs. Boston. 2008-09: Appeared in 81 games (81 starts), averaging 18.9 points, 9.6 rebounds, 3.5 assists and 1.00 blocks in 37.0 minutes … Ranked among league leaders in points (25th/18.9), rebounds (8th/9.6), FG% (5th/.567), blocks (27th/1.00) and minutes (24th/37.0) … Posted 39 20+ point games including six 30+ point games … Recorded 38 10+ rebound games and one 10+ assist game … Posted 37 double-doubles, including one triple-double … Led Lakers in scoring 13 times, in rebounding 43 times, in assists 19 times, in blocks 28 times and in minutes on 44 occasions … 2009 NBA All-Star … Scored 34 points 11/18 vs. Chicago … Missed only game of the season due to strep throat 12/16 vs. New York … Named European Player of the Year by La Gazzetta dello Sport 1/1 … Recorded 33 points and 18 rebounds 1/7 at Golden State … Recorded 31 points and 14 rebounds 2/2 at New York … Tallied 31 points and 15 rebounds 2/4 at Toronto ... Earned WC Player of the Week award for games played 2/2 – 2/8 … Recorded 3rd career triple-double with 12 points, 13 rebounds and a season-high 10 assists 2/17 vs. Atlanta … Earned second straight WC Player of the Week award for games played 2/17 – 2/22 … Named WC Player of the Month for February 2009 … Totaled 30 points and seven rebounds 3/1 at Phoenix … Posted a season-high 36 points (14-19 FG), 11 rebounds and seven assists 3/27 at New Jersey … Grabbed 5,000th career rebound 3/31 at Charlotte … Totaled 27 points and a season-high 19 rebounds 4/9 vs. Denver … Totaled 11,000th career point and 1,000th career blocked shot 4/14 vs. Utah ... In 23 playoff games (23 starts), averaged 18.3 points on .580 shooting from the field, 10.8 rebounds, 2.5 assists, 0.83 steals and 1.96 blocks in 40.5 minutes ... Posted 30 points and nine rebounds 5/10 at Houston … Recorded 21 points and a postseason-high 18 rebounds 5/17 vs. Houston … Posted 20 points, 12 rebounds, six assists and a playoff career-high three steals 5/29 at Denver. 2007-08: Appeared in 66 games (66 starts), averaging 18.9 points, 8.4 rebounds, 3.2 assists and 1.48 blocked shots in 35.6 minutes ... Ranked among league leaders in FG% (13th/.534) … Posted 24 20-point games (12 with Lakers), four 30-point games (2 with Lakers) and one 40-point game … Recorded 25 10+ rebound games (7 with Lakers) and 25 double-doubles (7 with Lakers) … Led Lakers four times in scoring (16 overall), twice in rebounding (25 overall) and six times in assists (11 overall) … Recorded a season-high seven blocks 11/19 vs. Seattle …Posted 26 points, 10 rebounds and seven assists 12/7 at New Orleans… Tallied 31 points and 13 rebounds 12/22 vs. Philadelphia … Posted 30 points and 12 rebounds 1/2 at Indiana… Totaled a season-high 43 points and 11 rebounds 1/11 at Golden State … Totaled 21 points, a season-high tying 18 rebounds, eight assists and four blocks 1/13 at LA Lakers … In first game with Lakers, scored 24 points (10-15 FG) while grabbing 12 rebounds 2/5 at New Jersey … Recorded 9,000th career point 2/6 at Atlanta … Scored 30 points (12-15 FG) 2/8 at Orlando … Posted 31 points and 10 rebounds 3/4 at Sacramento … Tallied 25 points and a season-high nine assists 3/9 vs. Sacramento … Missed one game with Lakers (2/3) with a sore back and nine games (3/16 - 3/30) with a sprained left ankle ... In 21 playoff games (21 starts), averaged 16.9 points, 9.3 rebounds, 4.0 assists and 1.90 blocks in 39.8 minutes ... Posted a playoff career-high 36 points, 16 rebounds and eight assists 4/20 vs. Denver … Posted 20 points and a postseason-high five blocks 5/7 vs. Utah … Grabbed a playoff career-high 19 rebounds 5/29 vs. San Antonio. 2006-07: Appeared in 59 games, averaging 20.8 points (.538 field goal percentage), 9.8 rebounds, 3.4 assists and 2.14 blocks, all team-highs ... Missed the first 22 games of the season due to a broken 5th metatarsal in his left foot suffered the FIBA World Championships prior to the season ... Missed one game during the season due to a hamstring injury ... Scored 20+ points 36 times, 30+ points six times, 10+ rebounds 33 times and posted 33 double-doubles ... Led Grizzlies in scoring 26 times, in rebounds 39 times, in blocks 38 times and in assists nine times ... Finished 8th in the NBA in blocks (2.14) and 11th in field goal percentage (.538) ... Became Grizzlies all-time leader in points scored with his 7,809th career point 3/7 at Toronto ... Became Grizzlies all-time leader in minutes, field goals made and free throw attempts throughout the season ... Recorded a season-high 35 points along with 15 rebounds 3/22 vs. LA Lakers ... Grabbed a season-high 17 rebounds 1/22 at Denver and 2/9 vs. Minnesota ... Tied a franchise record and career-high with eight blocks 1/29 vs. Sacramento ... Posted consecutive 30 point games 2/3 vs. Indiana and 2/6 vs. Houston ... Registered 2nd career triple-double with 17 points, 13 rebounds and a career-high tying 12 assists 1/24 at Utah. 2005-06: In 80 games (80 starts), averaged 20.4 points, 8.9 rebounds, 4.6 assists and 1.91 blocked shot in 39.2 minutes ... Totaled 40 20+ point games, 11 30+ point games and one 40+ point game ... Recorded 33 10+ rebound games, 33 double-doubles and one triple-double ... Led team in scoring 40 times, in rebounds 44 times, in assists 39 times and in blocks 49 times ... Named as a reserve to the WC All-Star team, the 1st player in Grizzlies history to earn the honor ... Twice named the WC Player of the Week: games played 3/20-26 and 2/27-3/2 ... Ranked 19th in the NBA in scoring, 17th in rebounds, 13th in blocks and 11th in minutes ... Scored a franchise record and career-high 44 points 3/28 vs. Seattle ... Became franchise's all-time leading rebounder 3/24 at New York when he grabbed his 3,072nd rebound ... Posted 1st career triple-double with 21 points, 12 rebounds and 12 assists 3/8 @ Seattle ... Scored 39 points 2/27 vs. Washington ... Hit a buzzer-beater 2/13 at Golden State ... Made 29 consecutive free throw attempts from 1/24-1/28 (tying 2nd best mark in Grizzlies history, including two straight games going 12-12 from the line, tying the best single-game mark in franchise history) ... Set a franchise record with 10 straight field goals without a miss 1/10 vs. Sacramento ... Grabbed a season-high 18 rebounds 1/6 vs. Utah ... Tallied 32 points, 13 rebounds, five assists and three blocks in a career-high 56 minutes 12/19 vs. Detroit ... Recorded 36 points, 15 rebounds and five assists 11/26 at Dallas ... Hit a buzzer-beater 11/112 at Atlanta ... Averaged team-highs of 20.3 points, 6.8 rebounds, 1.25 blocks and tied for the team lead with 3.0 assists in the four-game playoff series against Dallas. 2004-05: In 56 games (53 starts), averaged 17.8 points, 7.3 rebounds, 2.4 assists and 1.66 blocked shots in 32.0 minutes ... Posted 23 games with 20+ points, two games with 30+ points and 14 games with 10+ rebounds ... Recorded 14 double-doubles ... Led the team in scoring 26 times, in rebounds 25 times, in assists twice and in blocks 30 times ... Finished tied for 11th in the NBA in field goal percentage (.514) ... Blocked a season-high six shots 4/8 vs. Miami ... Placed on the injured list 1/25 with plantar fasciitis in his left foot, missing 23 games ... Tallied 31 points and four blocked shots 1/11 vs. Indiana, becoming the 10th fastest player to reach 5,000 points/500 blocks ... Completed a four-point play 1/11 vs. Indiana ... Selected Western Conference Player of the Week for 12/27-1/2 ... Handed out a season-high seven assists 12/7 vs. New York ... Scored a season-high 34 points along with a game-high 15 rebounds and three blocked shots 12/3 vs. Philadelphia ... Missed three games from Nov. 20 through Nov. 24 due to a right ankle sprain ... Tallied 17 points and a season-high 18 rebounds 11/19 at Sacramento ... Tied an individual and Grizzlies franchise record with five blocks in the first half 11/12 vs. Golden State ... Averaged team-highs of 21.3 points, 7.5 rebounds and 1.75 blocks during the four-game series in the playoffs against Phoenix ... Tallied 28 points, 16 rebounds and five assists in Game 2. 2003-04: In 78 games (78 starts), averaged 17.7 points, 7.7 rebounds, 2.5 assists and 1.69 blocked shots in 31.5 minutes ... Scored in double figures in 76 of 78 games, had 20+ points 27 times and 30+ points twice ... Posted 24 games with 10+ rebounds and 24, earning a double-double in each of those games ... Led the team in scoring 35 times, in rebounds 36 times and in assists five times ... Ranked 20th in NBA in field goal percentage (.482) and 18th in blocks ... Missed first game of his career due to a sore right foot on 4/5, snapping a string of 240 consecutive games played (then the 6th longest current streak of consecutive games played in the NBA) ... Scoring 32 points 12/30 vs. Seattle ... Grabbed a season-high 18 rebounds 3/12 vs. LA Clippers ... Tied a franchise record and set a career-high with eight blocks 2/20 vs. Phoenix while adding 17 points, 10 rebounds and five assists ... Scored a season-high 37 points 11/29 at Cleveland ... Grabbed 1,500th career rebound 11/12 at Orlando ... Scored 3,000th career point on 10/31 vs. Boston ... Averaged 18.5 points, 5.0 rebounds, 2.5 assists and 1.50 blocked shots in the playoffs. 2002-03: Improved his scoring from 17.6 points his rookie year to 19.0 points in 2nd season ... Finished 9th in the NBA in field goal percentage (.510), 10th in double-doubles (32), 12th in rebounds (8.8), 14th in blocks (1.80) and 30th in scoring (19.0) ... Led the Grizzlies in scoring (19.0 ppg), rebounding (8.8 rpg), field goal percentage (.510), blocks (1.80 bpg), minutes (36.0 mpg) and double-doubles (32) ... Started all 82 games (only Grizzly to do so) ... Scored 10+ points 73 times, 20+ points 42 times, and had 10+ rebounds 34 times and 32 double-doubles ... Led the Grizzlies in scoring 45 times, rebounds 34 times and tied for the team lead in assists twice ... Tied a season-high with 32 points on three occasions: 1/31 vs. New York, 2/26 at Philadelphia and 3/9 at Toronto ... Tied a season-high with 17 rebounds on four occasions: 12/8 vs. Phoenix, 1/22 at San Antonio, 1/23 vs. Sacramento and 3/3 vs. Boston ... Posted a season-high seven blocked shots 3/26 vs. Phoenix ... Handed out a season-high seven assists twice: 12/10 at Miami and 12/20 vs. Milwaukee ... Totaled 23 points and 17 rebounds 3/3 vs. Boston ... Recorded a double-double with 17 points and 11 rebounds in the got milk? Rookie Challenge game 2/8 during 2003 NBA All-Star Weekend at Atlanta. 2001-02: Won the NBA's Rookie of the Year Award and was named to the All-Rookie First Team ... In 82 games (79 starts), averaged 17.6 points, 8.9 rebounds, 2.7 assists and 2.06 blocked shots ... Was the NBA's got milk? Western Conference Rookie of the Month for November, January and March ... Finished 1st among all rookies in scoring, rebounds, blocks, field goal percentage and blocks ... Finished 2nd among rookies in minutes and 8th in assists ... Only Grizzly to play all 82 games ... Led team in scoring 37 times and rebounding 43 times ... Scored in double figures in 72 of 82 games, including 30 games with 20+ points and three games with 30+ points ... Posted 10+ rebounds in 39 games and had 35 double-doubles ... Scored a season-high 32 points to go along with 14 rebounds 4/5 vs. Houston ... Scored 31 points 1/8 vs. Toronto ... Totaled 30 points on 11-14 shooting and 10 rebounds 2/7 at Milwaukee ... Tallied 26 points and a season-high 17 rebounds 1/19 vs. Orlando ... Tallied 18 points, 11 rebounds and eight assists 4/14 at Houston ... Scored 27 points in first NBA start 11/6 at Phoenix. An early entry candidate for the 2001 NBA Draft ... Member of one of the top teams in the ACB, the top professional basketball league in Spain ... Was a member of teams that won the ACB Championship and Junior World Championship in 1999 ... Playing for Barcelona's junior team, he was an integral part of the team that won the 1998 Albert Schweitzer Tournament and the 1998 European Junior Championship ... Was named MVP of the Spanish National Cup (Copa del Rey) after leading team to victory in Malaga, Spain ... Delivered a breakthrough season in 2000-01 as a 20-year-old playing for F.C. Barcelona ... Played in 29 of team's first 33 games, averaging 11.3 points and 5.2 rebounds in 23.8 minutes. Drafted by Atlanta in the first round (third overall) of the 2001 NBA Draft … Draft rights traded to Memphis along with Lorenzen Wright and Brevin Knight for Shareef Abdur-Rahim on June 27, 2001 … Acquired by the Lakers along with a future 2nd round draft pick from the Grizzlies in exchange for Kwame Brown, Javaris Crittenton, Aaron McKie, the draft rights to Marc Gasol and two future first round picks on February 1, 2008 ... Signed as a free agent with the Chicago Bulls on July 19, 2014. Led Spain to the silver medal in the 2008 Beijing Olympics, averaging 19.6 points, 7.0 rebounds and 1.13 blocked shots ... Named MVP of the 2006 FIBA World Championships in leading Spain to the gold medal, despite missing the final due to a broken fifth metatarsal in his left foot ... Played for Spain in the 2004 Olympics, averaging 22.4 ppg, and 7.3 rpg ... Parents are Marisa, a physician, and father, Agusti, a hospital administrator ... Has two younger brothers: Adria and Marc, the latter a 6-10 center who played high school basketball at Lausanne in Memphis for two seasons before joining Pau's former team of F.C. Barcelona back in Spain ... Marc was drafted by the Lakers in the second round of the 2007 NBA Draft and subsequently was involved in the trade bringing Pau to Los Angeles ... Pau and Marc were teammates on the Spanish national team during the 2006 World Championships and 2008 Beijing Olympics ... Parents both played second-division basketball in Spain ... His parents and brothers lived with him in Memphis during his rookie season ... Speaks three languages: Catalan, Spanish and English ... Native of Catalonia, a region on the coast of Spain ... Planned to become a doctor and attended a year of medical school at the University of Barcelona at age 18 until pro basketball changed his plans ... Began playing at the age of seven, and started as a point guard until he was 13 ... First contact with the NBA was at age 12, watching the original Dream Team on television win the Olympic Gold Medal in Barcelona in 1992 ... Lists Michael Jordan as the most exciting player he's ever played against ... With Memphis, was a six-year sponsor of Tickets for Kids with "Pau's Amigos" ... Was a member of the Grizzlies' All-Star Reading Team, and participated in the Grizzlies' Stay in School Challenge Reception and Read to Achieve Celebration ... During the 2006-07 season, he co-hosted the annual Staxtacular event, a fundraiser to benefit the Stax Music Academy ... Has done public service announcements for Memphis City Schools Reads, UNICEF and Memphis City Schools Fight Free Fifty, which encourages MCS students to go 50 days without fighting in school ... Is the ambassador for Spain's UNICEF Committee, and during the summer of 2005 he visited South Africa with the organization to act as an ambassador in the fight against AIDS ... Also made a trip to Angola in the summer of 2007 with UNICEF where he visited a children's hospital and raised awareness for children with HIV and AIDS ... Pau has participated in UNICEF and the NBA’s “Unite For Children, Unite Against AIDS Campaign” since its inception in 2006 and is also an ambassador for FAD and the Youth Association “Sonar Despierto” ... Unveiled the 12th Reading and Learning Center at the Boys and Girls Club of East LA (October 2008) ... Served Thanksgiving Dinner to members of the Boys and Girls Club of Venice during our "A Season of Giving" event ... Spoke with elementary school students about his healthy habits and then led them in basketball drills during the Lakers inaugural Fit For Life Timeout.